For more than 20 years, Christmas in November at the Fairmont Jasper Park Lodge has signified the beginning of the holiday season for thousands of guests. This year, the event has a new look with the theme of “Refresh.” New program offerings and some of Canada’s finest chefs, wine experts, health and wellness coaches and decorating personalities will share their secrets for creating a memorable holiday. The Fairmont Jasper Park Lodge is pleased to announce Food Network star Michael Smith will take on hosting duties this year and welcome guests in a series of three packages beginning November 5th and running until November 14th. Guests will celebrate the beginning of a new decade with innovative and refreshing experiences from new presenters, interactive programming and the much anticipated addition of The Lodge’s Fairmont Spa. Enter at deVine’s to win one of two weekend packages for two to attending Christmas in November at the Fairmont Jasper Park Lodge on the weekend of November 5-7. Chateau de Beaucastel has been around for a long time, since 1549 to be exact. Their wines have drawn admiration going back to the days of Louis XIV. Owned by the Perrin Family since 1909, it is one of the largest estates in the famed Chateauneuf-du-Pape (CdP) region in the Southern Rhone. The Perrin Family acquired the estate just after the devastating phylloxera attack when all 13 allowed grapes were then replanted. They believe in organic farming and has been practicing that since the mid 1960’s and became organically certified in 1994. The stony, porous soil of the land results in good air circulation as well as poor water retention forcing the vines to dig deep for its nutrition. The surface composed of the famous galets (fist sized rounded stones) that absorb heat during the day and lets it out at night. Combined with low yields, old vines, hand-harvested, destemmed and no filtration, it all adds up to a wine true to the famous rocky terroir and one of the most sought-after in all of France. While most CdP producers have a high percentage of Grenache, Beaucastel is unique in the sense that they have the highest percentage of Mourvedre in their wines, usually equal parts of Grenache and Mourvedre (30% each). Always displaying fresh ripe fruit, complexity, structure and power, it has a distinctly earthy nose, full of expression and uniqueness. Ageworthy and highly collectible. 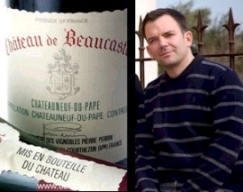 Please join fifth generation owner Thomas Perrin for a Top Drops: Chateau de Beaucastel evening of high-end wines on Wednesday, October 6 at 7pm at deVines. View the lineup and sign up for this event here..